Notes: One half bushel of mixed hosta will cover an average of 75 square feet when planting in sweeps. Premier shade plant for the southeast. 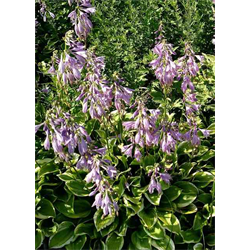 Most notable for their foliage, hostas will thrive in damp, shaded areas where nothing else will. Use these variegated leaf Hostas along ponds, woodlands, or in the border. Height listed corresponds to average foliage height; flowers will generally be 12 to 24 inches taller than foliage height. Buy your variegated Hosta plants today!